Navigate to the TimeSheets > View Timesheets screen. There you will see a light blue "Export to Xero" button. Before clicking this button, be sure to review the timesheets for accuracy so that only verified, correct time activities get exported to Xero. 2. After clicking the "Export to Xero" button, the next screen will ask you to confirm the export. a. Change the dates of the timesheets being exported. b. View the total number of time records preparing to be exported. To fix any un-mapped employees, check out this article on mapping Xero employees with ClockShark employees. 3. 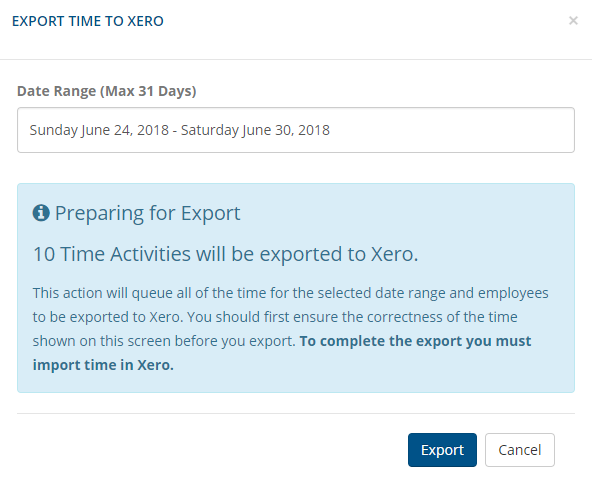 After you click the blue "Export" button, you will receive a confirmation for the number of time records that have been successfully exported to Xero! ⚠️Important Note: The Xero integration is not available for New Zealand and UK customers.